Caroling Across America In 1979, the Nebraska Theatre Caravan began touring the late Charles Jones’ original version of A Christmas Carol. And now in 2017, it is still going strong! Unlike the original novella by Dickens set in 1843, this version has been pushed ahead about 40 years, allowing the show to include many beloved Christmas Carols and beautiful costumes that seem to have leapt off a Currier & Ives print. I first heard of the Caravan at a large cattle-call audition in Memphis, TN. I was called back for and subsequently cast as Jacob Marley, the tortured soul and former business partner of our curmudgeon of a protagonist. 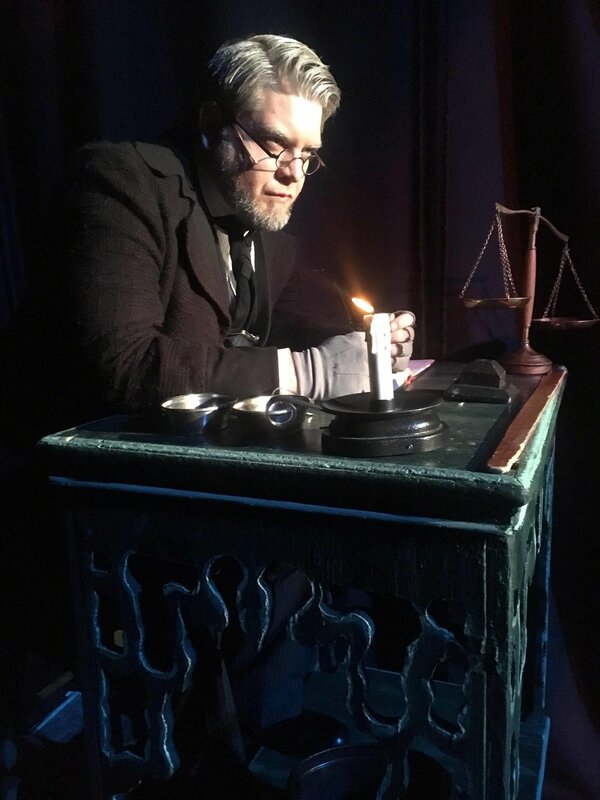 Now, for the past two years, I have taken on the mantle of Ebenezer Scrooge, and what a ride it has been! This Christmas season the Caravan rehearsed for a couple of weeks in Omaha, NE, then hit the road and opened our show at the amazingly gorgeous Ohio Theatre in Columbus, OH. By our final show (Melbourne, FL) on Dec. 23, this years' tour will have performed in fifteen cities. Book-ended by a wonderful rendition of God Rest Ye Merry Gentlemen, the show is a whirlwind of expertly designed sets, beautiful costuming, tantalizing special effects, and a cast, crew, and 4-piece orchestra of professionals from all over the country. This show is only as special as the people involved with the show. The production staff, crew, musicians, and cast involved with this particular production are the epitome of special. All the backgrounds, personalities, and people involved, converge to make a unique telling of A Christmas Carol every year. When touring any production, getting along with co-workers is key. Long bus rides, two show days, and early mornings, are just a few of the challenges of touring a show, but when I’m surrounded with people I love, these challenges not only become bearable, they have become part of my Christmas memories! Even on a tiring day, it’s not difficult to don my Scrooge nightgown and cap, with an army of beautiful individuals at my side! Together we are spreading Christmas joy to thousands across the US! You can find out if Andy will be in a show near you by clinking this link!